Chocolate - The Chocolate Connoisseur. Chocolate: A Bittersweet Saga of Dark and Light by Mort Rosenblum. Domori's Milk 'Latte Sal' and their Dark 'Porcelana' and 'Puertomar'. 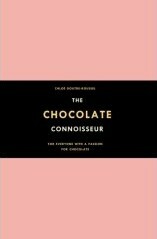 The next step is to ponder your chocolate history and more detail on your preferences, as well as where you would like the book to take you in terms of depth and breadth of chocolate experience. How to start making notes on your taste preferences and how to discover and shop for chocolate. Have no more than 15% difference in percentage of cocoa solids among the chocolate to be sampled. It's all milk bars or all plain bars. Set up the samples without tell-tale packaging or identification. Participants should not drink tea, coffee, or alcohol, or eat in the prior 2 hours. Provide palate cleansers: water and bread. One game is to provide three samples: three are different and the 4th is a duplicate. Can your friends tell which sample is duplicated? Shows you criteria to help you pick other bars than those she recommends. Ganaches. One plain milk and one plain dark. Both should have zero alcohol. Marzipan. Not flavored: no added pistachio or alcohol whatsoever. Pralinés. Not flavored; no chocolate added to the ground nuts and caramel that comprise praliné. House specialty. Two of whatever they are most proud. See her book for information on how to judge these samples and for her recipe for making your own truffles. This is a section of PR and spin. Mainly a sample day at her job as the Fortnum & Mason's chocolate buyer. The book ends with a Glossary and Bibliography. Obtain a variety of Real Chocolates. Look for 50% to 70% cocoa solids. High, but not exaggerated cocoa content is suggested. The origin and variety of the cocoa beans will tell you more about the chocolate's quality than anything else. Any added vanilla should be real vanilla, not vanillin (an artificial flavoring derived from pine trees). For comparison, you might want to include some Fast Chocolates, though some would say "why bother." Yes, eat dessert first. Test-taste chocolate on an empty stomach. Have the chocolate at room temperature. Danger: if you store it in a refrigerator, you may cause the cocoa to separate, creating a white bloom on the surface. Naturally, in a test, you are sampling different chocolates. Taste them in sequence, according to their percentage of chocolate. Some suggest that you begin with the one containing the least cocoa: white chocolate, which may have cocoa butter, but it has no cocoa at all. The next lowest will be the milk chocolate. Others, like Chantal Coady suggest that you begin with the one containing the greatest percentage of cocoa. Set up some glasses of water, perhaps room temperature, so that you can clear your palate between samples. Smell. Sniff the chocolate. What do you notice? Fruit? Woody notes? Spices? Tobacco? etc. Sound. Break the chocolate close to your ear and listen. Real chocolate contains cocoa butter crystals, and will have a distinct snap. Fast chocolate, on the other hand, "is more like plasticine; expect a dull thud." Sight. The bar itself should be flawless and lustrous. When you have broken the chocolate bar, look at the features of the break. It should not collapse in crumbles and splinters. It should be glossy (indicating freshness) and reddish (indicating that it was not over-roasted). Touch. Cocoa butter melts at 94°F. It should melt at body temperature. The higher the quantity of cocoa butter, the better quality the chocolate and the lower the temperature at which it melts. Taste. Finally we get the point of it all!! Allow the chocolate to sit in your mouth for a few seconds to release its primary flavors and aromas. Then chew it a few times to release the secondary aromas. Let it rest lightly against the roof of your mouth so you experience the full range of flavors. Finally, enjoy the lingering taste in your mouth. This will reveal how smooth is the chocolate (its particle size will be so fine in real chocolate that you will not notice it); its finish (lingering deliciously, without any greasy residue); and the perfume of the released volatile aromas as the chocolate melts in your mouth.